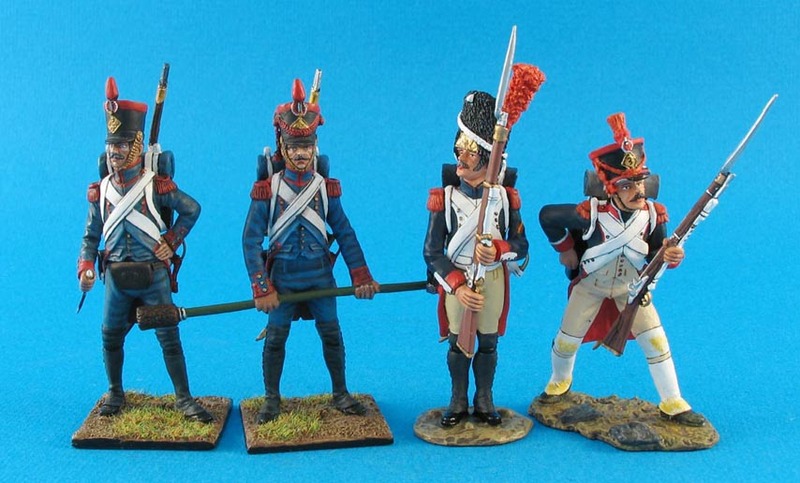 There are many figures scales out there for both Toy Soldiers and Historical miniature wargames figures and even different classifications within the same scale. Thus, we want to provide you with this simple guide to the scale of our figures. All of our painted figure ranges are 60mm or true 1/30th in scale. 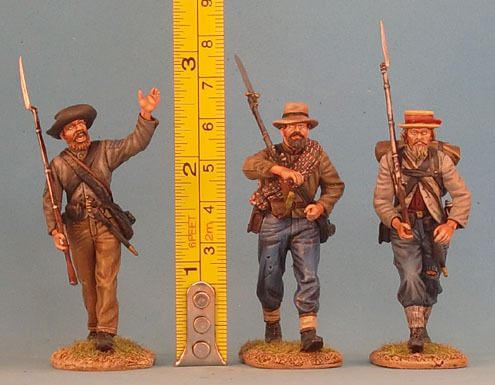 Please note that we have changed our descriptions from 54mm to 60mm simply because it more accurately describes the actual size of the figures. We have not changed the size of the figures, only the classifications! If this doesn't fully answer your questions regarding scale, please don't hesitate to contact us. We are quite often asked about the relative size of our figure ranges as compared to one another. 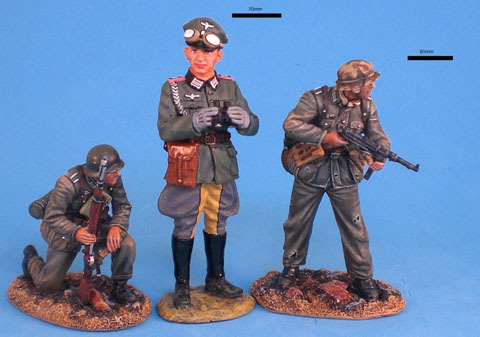 To assist you with this we've take a figure from a few of our ranges and photographed them next to one another. As you can see, most everything is pretty close in size with perhaps the Crusaders being a tiny bit bigger and the WWII being a tiny bit smaller. But generally speaking, the goals of the scales are to be true 1/30th or 60mm but as with any artistic endeavor such as this, some slight variance may exist from sculptor to sculptor! 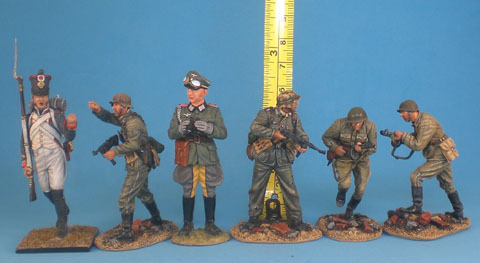 This range is a true 1/30th or 60mm scale figure range with figures averaging about 60mm tall. In terms of height, they will work well with most figures, however, in terms of style, they tend to be correctly and accurately scaled so whether they are "compatible" with figures from other makers is entirely up to you of course. 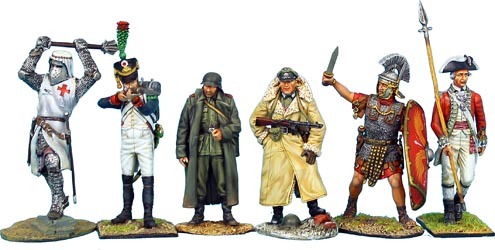 Like our WWII range, the sculpting is full of movement and are some of the finest figures we've done to date. We have provided the image below so as to eliminate any questions or confusion about the actual size of the figures. 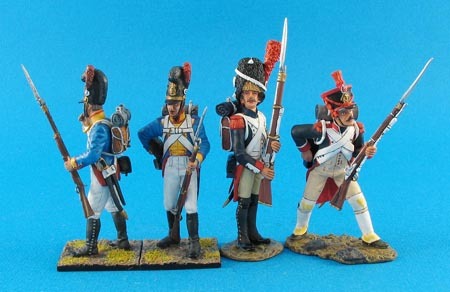 This is a 60mm or true 1/30th scalle figure range. The sculpting is extremely realistic and full of movement and character unlike anything even we have ever produced. In terms of overall size, the figures range in height from about 58-60mm and are a bit more slight than our other figures. 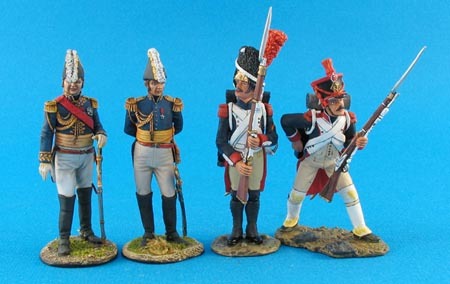 The result, we feel, is that these figures look less like toy soldiers and much more like actual small men!!! Please see the images below to clarify any sizing and figure compatibility issues. Personally, we feel that our figures are best displayed with each other as they are a different size and style than what's currently available. This is of course up to you, but we felt we should provide you with the information. 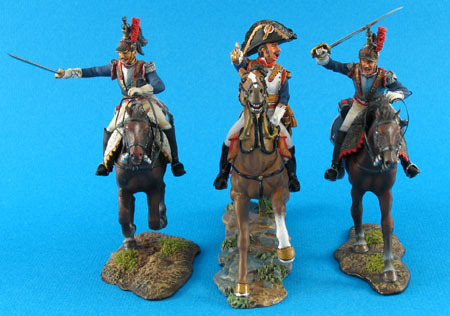 First Legion's Napoleon's Europe is a true "1/30th" or 60mm scale product range. 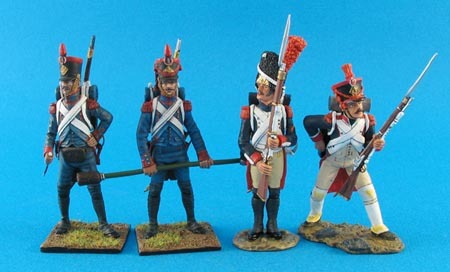 First Legion's 40mm Napoleonic Wars historical miniatures are about 36-38mm from the sole of the figure's foot atop the figure base to the eyes. 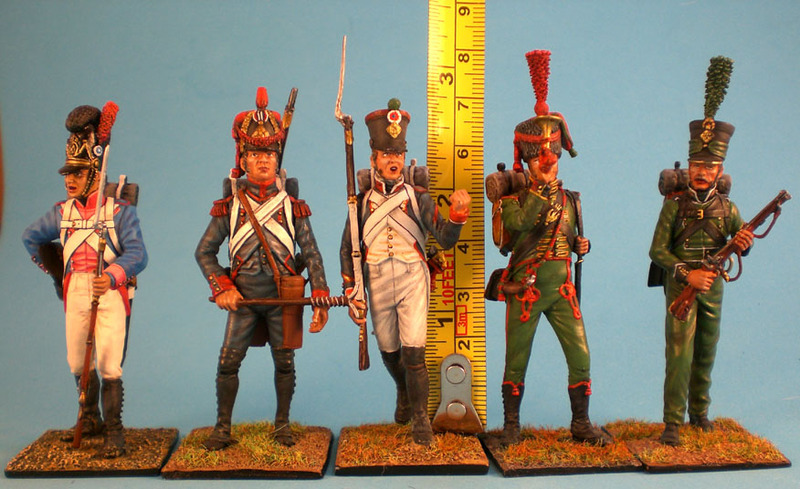 From the bottom of the figure base to the top of the shako, using a French Voltigeur as an example, is about 44mm-45mm. 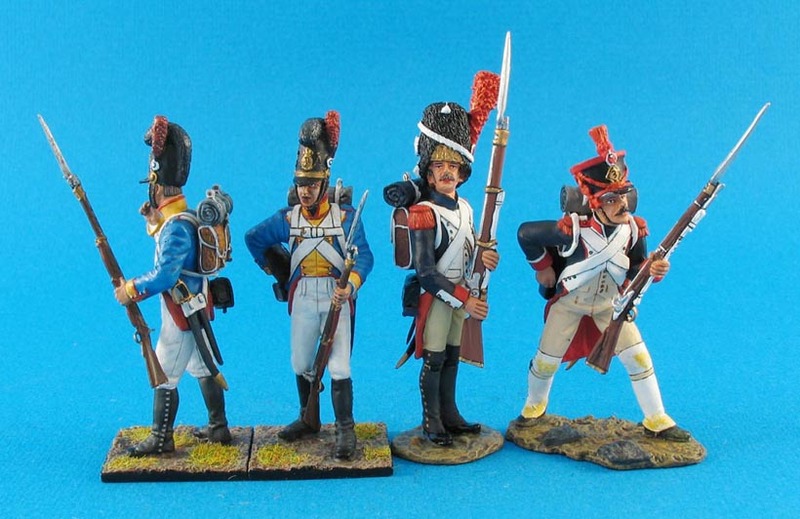 They seem to be compatible with most other 40mm figure ranges out there.